I am using win10 (most recent updates), Chrome, and Webroot for Virus. When I shut down I occasionally get a message saying that "1 app is stopping shutdown" or words to that effect, and a choice between "shut down anyway" and "cancel". It does not tell me which app it is. I cancel. I open task manager and task manager is the only app running. So I try to close again and again I get the same message. I choose "shut down anyway" and the laptop shuts down as usual, normally, that is, almost instantly. Could anyone please tell me how to find out what app the machine is talking about? It's not a big problem because all programs work perfectly when I next reboot, but not knowing what is causing this issue is rather annoying. 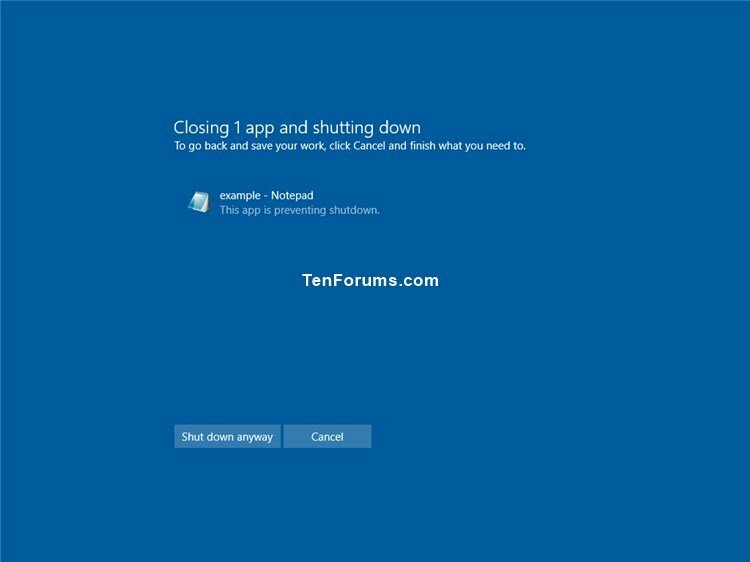 Usually, the End Task dialog will show you the app or process preventing shutdown. If you like, you could adjust HungAppTimeout to a low value and turn on AutoEndTasks to have the End Task dialog auto close and continue for you. Thanks Brink for your reply. I did what you suggested and so far, so good. However, I still would like to know how to find out which app is stopping the shutdown. As I said in my original post, when I open task manager, task manager is the only app running. Shouldn't there also be the actual app that is causing the problem; it is obviously still running? You could try performing a clean boot to troubleshoot and shut down between testing to see if it may reveal culprit. Same happened here. Latest Win10 insider builds. I open task manager and task manager is the only app running. Quite odd! Just about every tab in Task Manager is well-populated with information, except possibly Startup. Are you an Insider, as ap1978 is? I followed all the advice given and what do you know? the same problem with shutdown occurred last night. I chose "shutdown anyway" and it shut down instantly. @pyramid10: I don't know what an Insider is, so, I'm afraid, I cannot answer your question. I'm just a 73 year old who uses Word Processing, Spreadsheet maker, and, occasionally, a PDF reader and One Note 2010 for studying. Every morning I read the news from London, Paris, Rome, Buenos Aires, and Ottawa, Canada using Chrome. I have updates set on automatic. I also check the weather before going out as I have to be careful for my health. Please let me know if that makes me an Insider (whatever that is). An Insider is supposedly Windows OS beta-testers who make Windows 10 jump through hoops to see if bugs occur before the OS is released to the public. So, which tab in Task Manager only shows one app, Task Manager? My guess on the offending app that prevented shutdown in the past is likely associated with Windows Update, since that is set to Automatic. I don't know how to change the "automatic" in Windows Update. When I had Win 7 I used to get an alert telling me there are updates and allowed me to choose which updates to install. I used to select just the important ones. I should very much prefer that process. That is not so with my Win 10; it just installs whatever it wants. To me pyramid10 is just a username with whom I should like to correspond privately (which I don't know how to do) just to practice my Norwegian which I have not used for over 5 years. If you like for now, you could create a shortcut using the command below for an instant force shutdown shortcut you could use to shut down the computer. When you see the End Task dialog like below, does it show any details for what app is preventing shutdown?